At the invitation of Foreign Minister Workneh Gebeyehu of the Federal Democratic Republic of Ethiopia, Chairperson Moussa Faki Mahamat of the African Union Commission, Minister of Foreign Affairs and Cooperation Alpha Barry of the Republic of Burkina Faso, Foreign Minister Mamadou Tangara of the Republic of the Gambia and Foreign Minister Sidiki Kaba of Senegal, State Councilor and Foreign Minister Wang Yi will pay official visits to the aforementioned countries and organization from January 2 to 6, 2019. Q: For over 20 years, the Foreign Minister of China has been choosing Africa as the destination for his first overseas visit each year. What is the main goal of State Councilor and Foreign Minister Wang Yi's visit this year? A: Each year the Chinese Foreign Minister will choose Africa as the destination for his first overseas visit. State Councilor and Foreign Minister Wang Yi's upcoming visit to Africa is a continuation of this fine tradition, which once again speaks volumes about the high priority China consistently attaches to developing its ties with Africa. 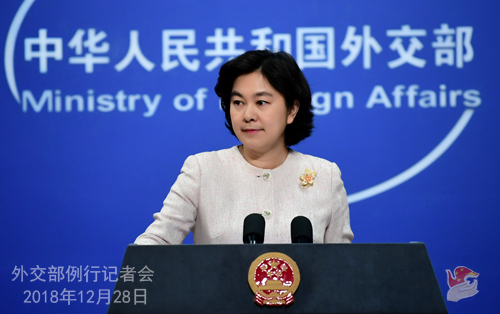 This is also the Chinese Foreign Minister's first visit to Africa after the Beijing Summit of the Forum on China-Africa Cooperation (FOCAC) was successfully held in September this year. State Councilor and Foreign Minister Wang Yi's upcoming visit will follow the guidance of Xi Jinping Thought on Diplomacy and uphold the principles of sincerity, real results, amity and good faith and upholding justice while pursuing shared interests to strengthen communication and alignment with the African countries, implement the important consensus reached by President Xi Jinping and African leaders and jointly follow through on the outcomes of the 2018 FOCAC Beijing Summit so as to move forward the bilateral ties between China and relevant African countries and China-Africa relations as a whole. Q: The Maldives' Minister of Foreign Affairs Abdullah Shahid said in an exclusive interview on December 27 that under the Belt and Road Initiative, many projects for social welfare including the China-Maldives Friendship Bridge and public housing have flourished. The Maldivian government will continue its cooperation with China under the framework of the Belt and Road Initiative to create better and more favorable space for bilateral cooperation. What is your comment? A: Foreign Minister Shahid's positive evaluations of China-Maldives relations and the cooperation between the two countries under the framework of the Belt and Road Initiative reflect the good will of the new Maldivian government towards developing China-Maldives relations. We appreciate that. You have seen that in recent years, on the basis of mutual respect and equal treatment, China and the Maldives have promoted cooperation in infrastructure and livelihood projects such as bridges, airports and housing, which has played a positive role in promoting the Maldives' economic transformation and upgrading and the improvement of its people's living conditions. In particular, in August this year, the China-Maldives Friendship Bridge was completed and opened to traffic, realizing the century-old dream of the Maldives to have a cross-sea bridge. It not only promoted the infrastructure connectivity and development of the Maldives, but also greatly facilitated the travel of local residents, thus warmly received by the Maldivian people. China is willing to work with the new Maldivian government to consolidate traditional friendship, strengthen the alignment of our respective development strategies, make good plans for bilateral pragmatic cooperation, and advance the win-win cooperation under the framework of the Belt and Road Initiative so as to enrich and inject new impetus into the future-oriented China-Maldives comprehensive friendly and cooperative partnership. Q: Do you have any other information about the Canadian citizen who is due to go on trial in Dalian tomorrow on drug-smuggling charges? For example, when was he arrested and could you offer some details about the drug-smuggling he is accused of? What communications has China had with Canada about this case? 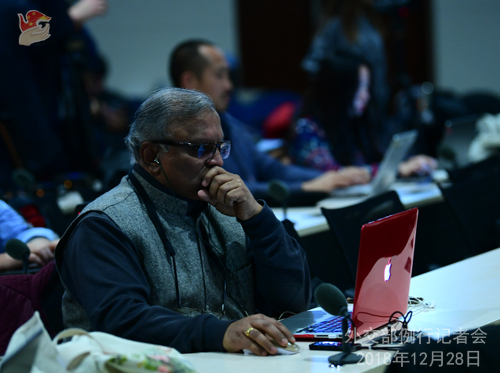 A: I have taken note of the notice that an appeal on the drug-smuggling charges against Robert Lloyd Schellenberg will be heard by Liaoning High People's Court. I would refer you to the competent authority for specifics. China and Canada maintain unimpeded consular communication. We will provide necessary assistance for the Canadian side to fulfill its consular duties. 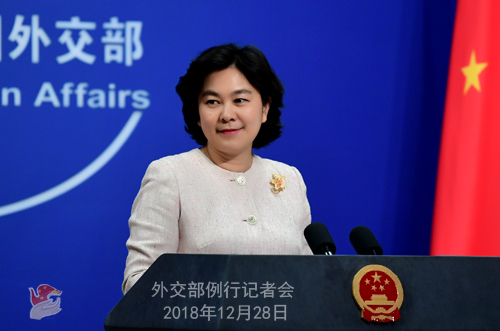 Q: According to reports, on December 26, State Councilor and Foreign Minister Wang Yi , when attending the National Conference of Directors General of Local Foreign Affairs Offices, announced that in 2019, the Foreign Ministry will support the work relating to local foreign affairs in six practical aspects. Could you tell us what the six practical aspects are? A: We have issued the readout on State Councilor and Foreign Minister Wang Yi's attendance at the National Conference of Directors General of Local Foreign Affairs Offices in Anhui. State Councilor Wang Yi said that the local foreign affairs offices, when engaging in the work relating to local foreign affairs in the new era, should implement the spirit of the Central Conference on Work Relating to Foreign Affairs in a profound manner, raise political awareness, strengthen the centralized and unified leadership of the CPC over the work relating to local foreign affairs, act on the requirements of seeing Party self-governance exercised fully and with rigor, leverage local resource advantages and make all-out efforts to serve China's overall diplomacy and high-quality development so as to open up new prospects and break new grounds. Like you said, State Councilor Wang Yi also announced that in 2019, the Foreign Ministry will support the work relating to local foreign affairs in six practical aspects. One of the important missions of the Chinese diplomacy is to help and serve local development and serve as a bridge for the exchanges and cooperation between China and other countries at the sub-national level. Meanwhile, we have been playing an important and positive role in promoting the communication and cooperation between the diplomatic envoys and local governments. In the coming new year, we will continue to hold the promotional events to present Chinese provinces to the world, showcase the remarkable achievements over the past 70 years since the founding of the People's Republic of China and demonstrate that stepping up foreign exchanges and expanding opening-up at the sub-national level hold a promising future. The regular press conference of the Ministry of Foreign Affairs will be adjourned on December 31, 2018 (Monday) and January 1,2019 (Tuesday) for the New Year holiday, and resumed on January 2 (Wednesday). 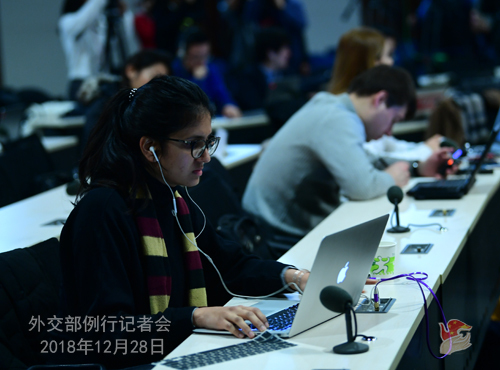 During the adjournment, journalists could send questions to the Spokesperson's Office by telephone, e-mail or fax. This is the last regular press conference of the Ministry of Foreign Affairs in 2018. Over the past 12 months, you have witnessed, together with all of us, the pioneering progress of China's diplomacy featuring openness, cooperation, responsibility and perseverance. Dear journalists and friends, we would like to express our sincere gratitude to your active participation in and support for the regular press conference of the Ministry of Foreign Affairs. We look forward to continuing with our close communication and cooperation with you in the coming new year. I believe we will continue to get along quite well. Also on behalf of all of my colleagues at the Information Department of the Ministry of Foreign Affairs, I would like to take this opportunity to wish everyone a Happy New Year in 2019. I wish you all good health, every success at work, and happiness at home!